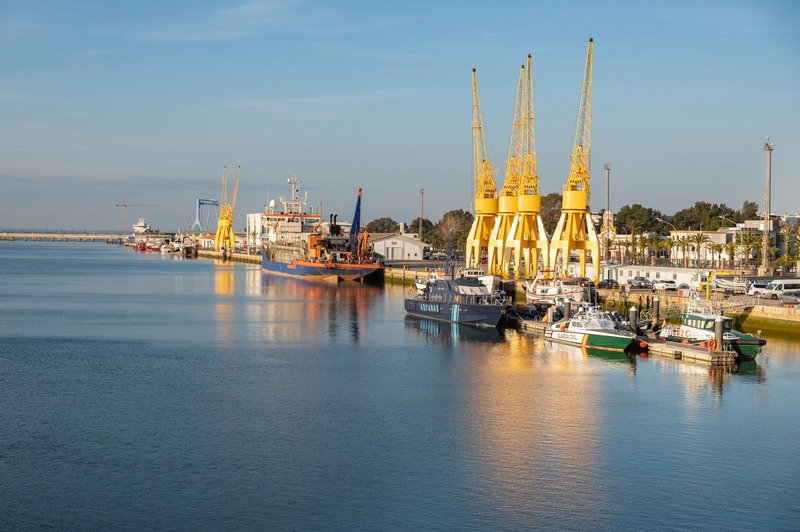 Huelva is a small city in Spain’s south-western Andalusia. 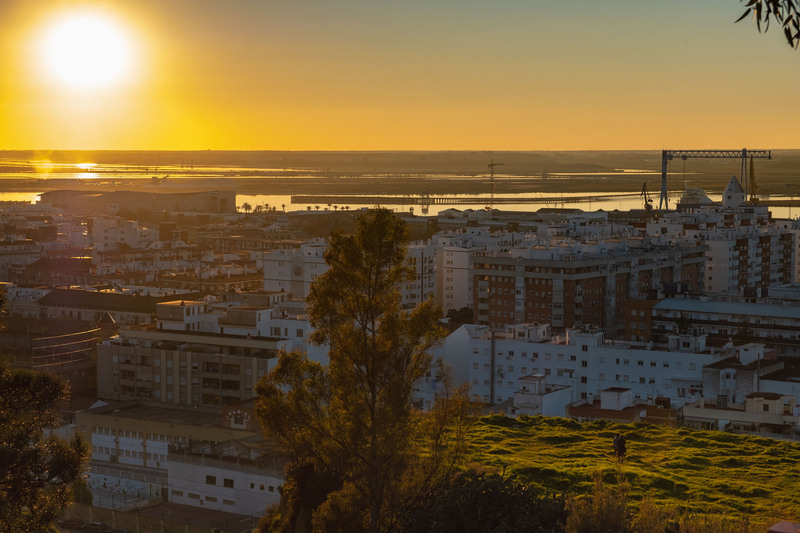 Located along the Gulf of Cádiz coast, at the confluence of the Odiel and Tinto rivers, Huelva has a population of nearly 150,000 people. 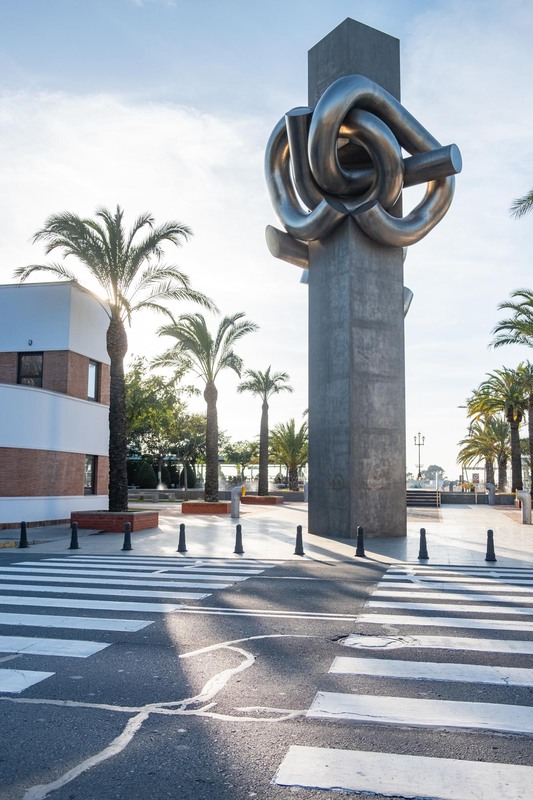 After spending some time in Seville, Tarifa and Cadiz, we thought it’d be good to see what this corner of Spain had to offer. 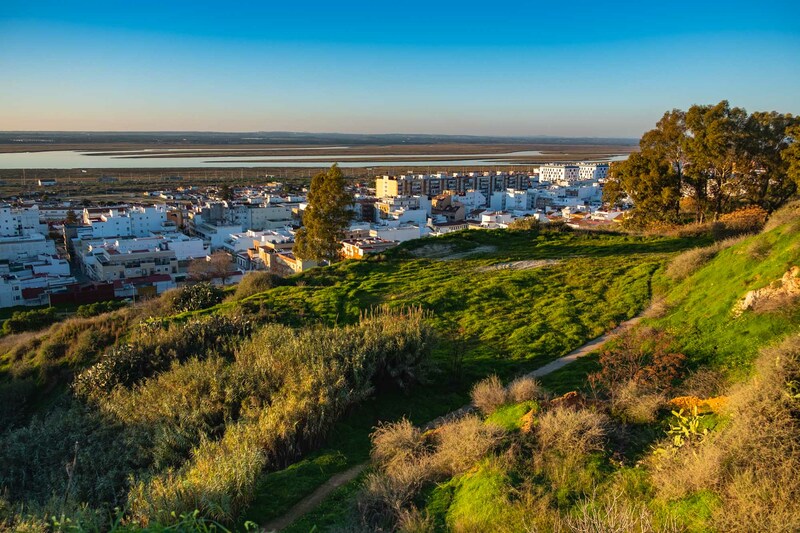 Many of Huelvas attractions are focused on Christopher Columbus or Cristóbal Colón (as he is known in Spain) as Huelva is where he planned his trip to the Americas. It’s not entirely clear how much time he spent here exactly, however he was staying in the monastery whilst awaiting funding to visit the Americas, and following funding, his ship’s crew were provided by the Monastery. 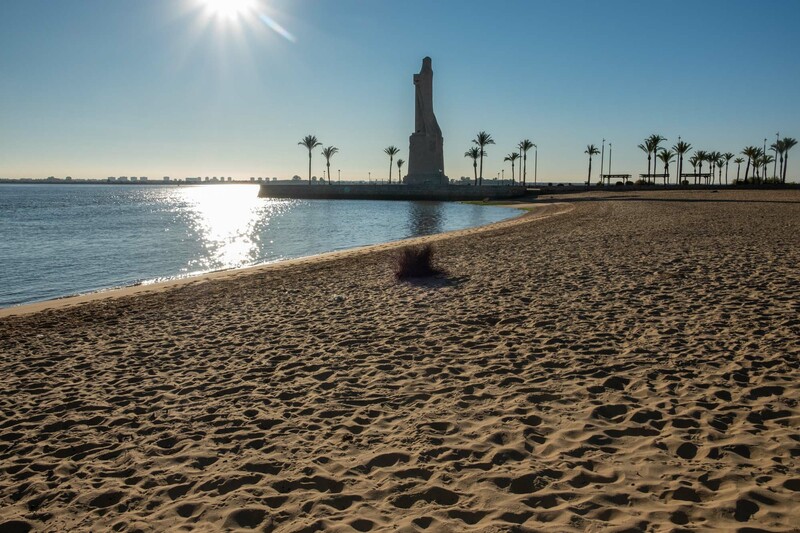 There is a monument to Christopher Columbus in the old town on Plaza de la Monjas, a very small museum (museo de Huelva) which focuses on the city’s Roman history – which has mostly been forgotten. The Casa Colon (Columbus House) was built in 1881 to celebrate the 400th anniversary of the discovery of America in approximately 1492. Mining was a big deal and the hotel was supposed to be a luxurious establishment for receiving mine investors. It failed and was bought out by Rio Tinto (Mining Company). It now stands as an exhibition centre. 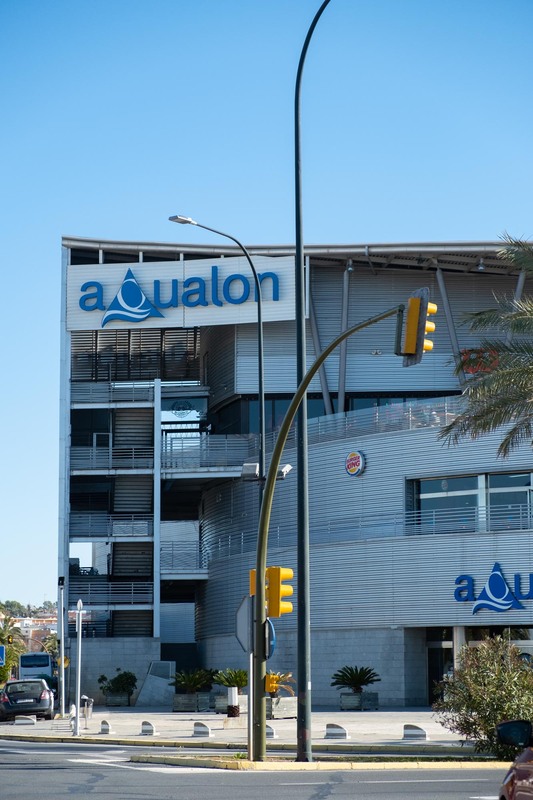 Aqualon is on the outskirts of the city centre near the parks. It currently houses a cinema, a bowling alley and a burger king. 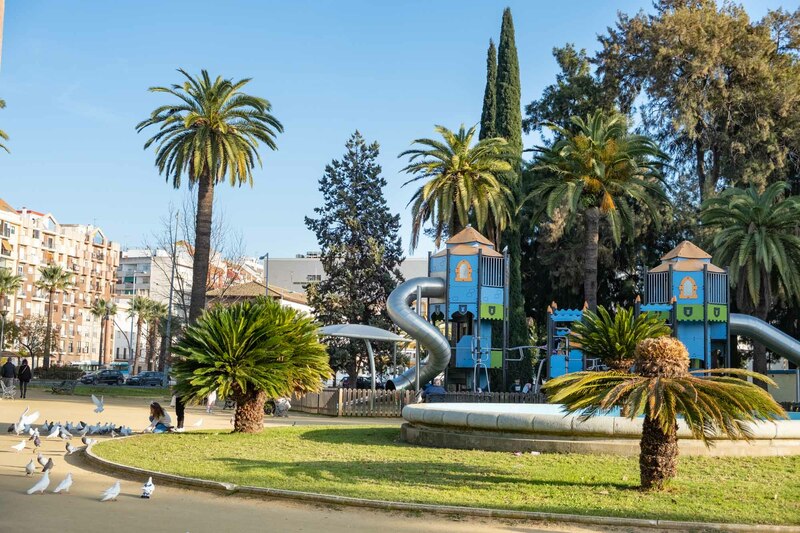 A large park near the centre of Huelva. 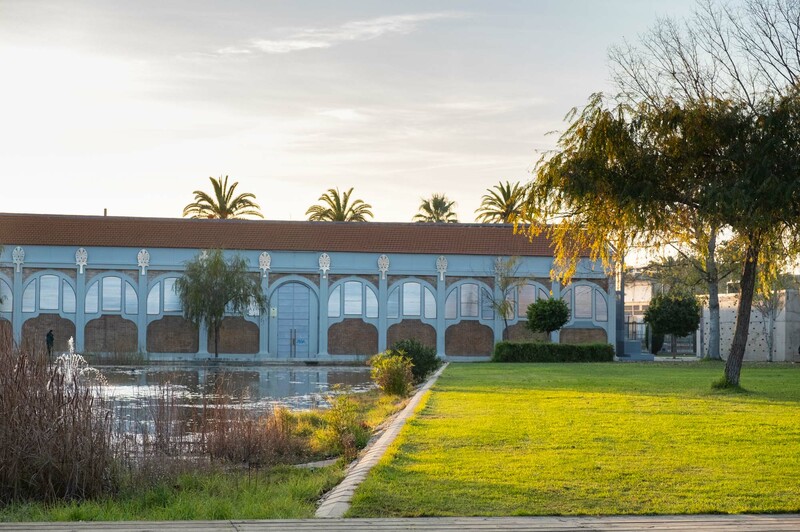 It contains a pond with a rotating fountain, pretty rose gardens, an antique train engine replica, two small children’s play parks and a dog park. 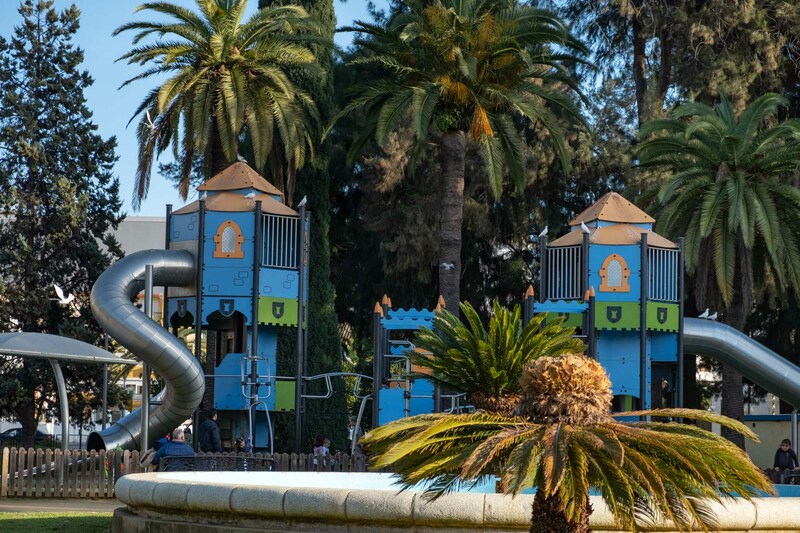 Right next to the Zafra park is a much smaller park with a large children’s play park and an attractions park. 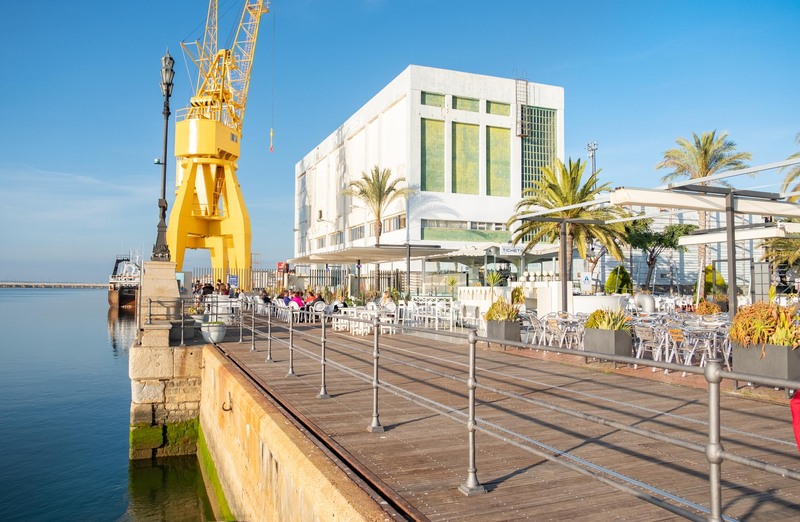 Directly opposite the Parque is a dock with a restaurant ‘Cerveceria Bonilla’. 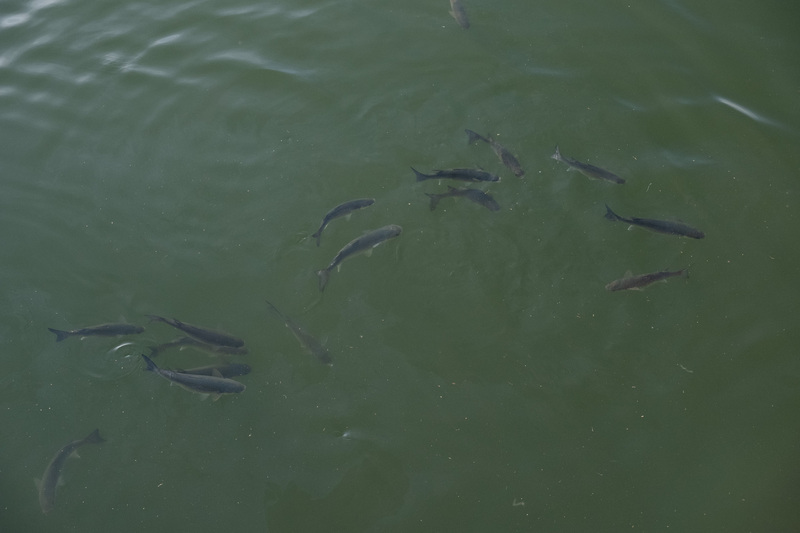 Here you can catch the boat that goes across to Punta Umbria, admire the huge fish and have a drink! 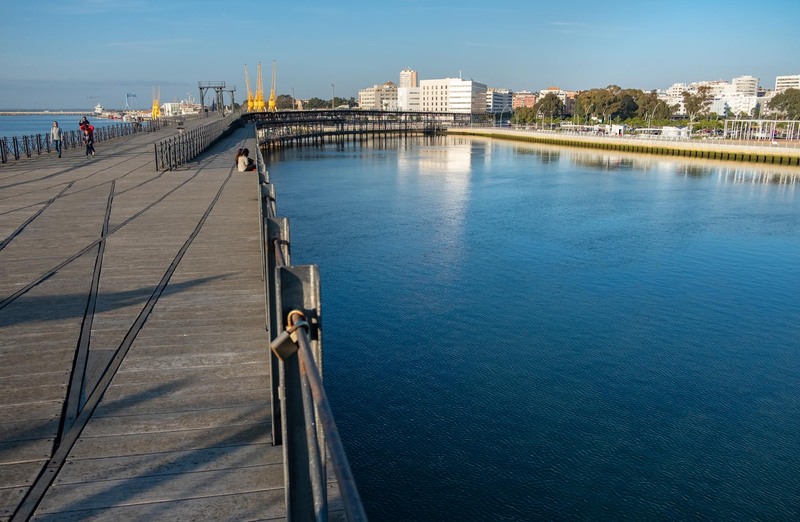 The Muelle del Tinto pier is over 1km long and was built in the 1870’s at a wharf to allow shipping of the minerals which were being mined in the area. 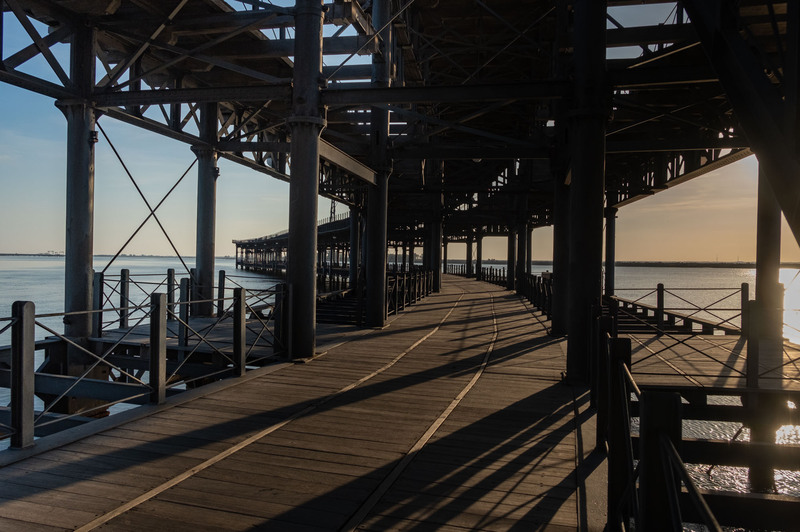 Over the last few decades the pier has been rehabilitated and declared a monument of cultural significance. 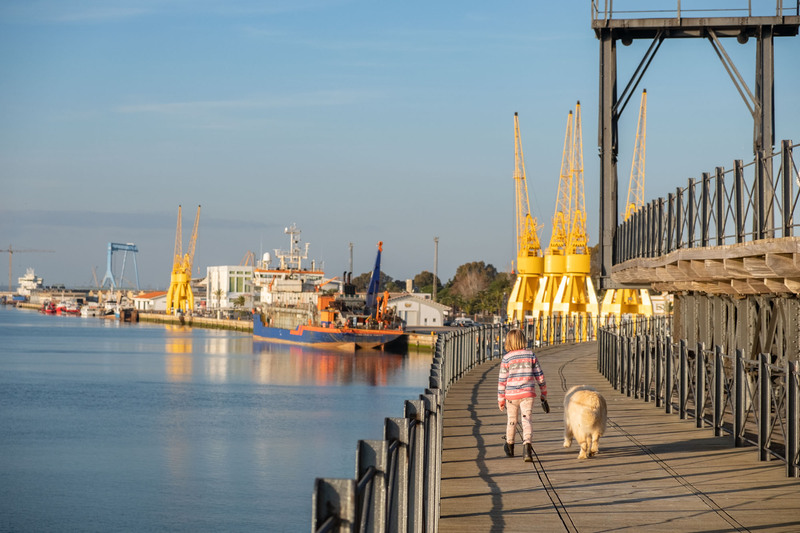 Now it is not in commercial use, but visitors can walk, bike or fish on the wharf and it serves as an extension of the waterfront promenade area. 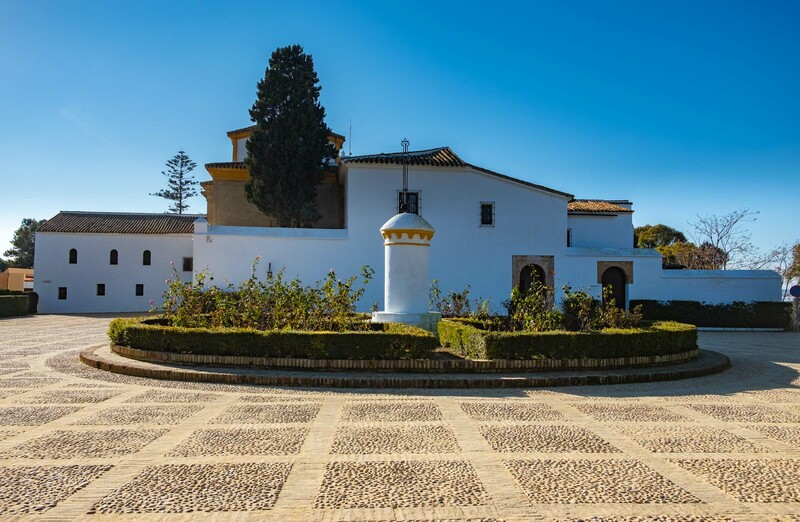 La Rabida Monastery is a Franciscan Monastery where Christopher Columbus resided in 1490 while he was waiting for financial backing for his plans to discover the new world. Family entrance is €7. At Muelle de las Carabelas you can see replicas of the three ships which discovered America. The Niña, Pinta and Santa María were built to celebrate the 500th anniversary of the discovery. The museum is hands on and you can explore the ships. Family entrance is €7. The Monument Plus Ultra commemorates the first transatlantic flight between Spain and America. Opposite the dock is the Foro Iberamericano, an outdoor auditorium for summer plays and concerts. 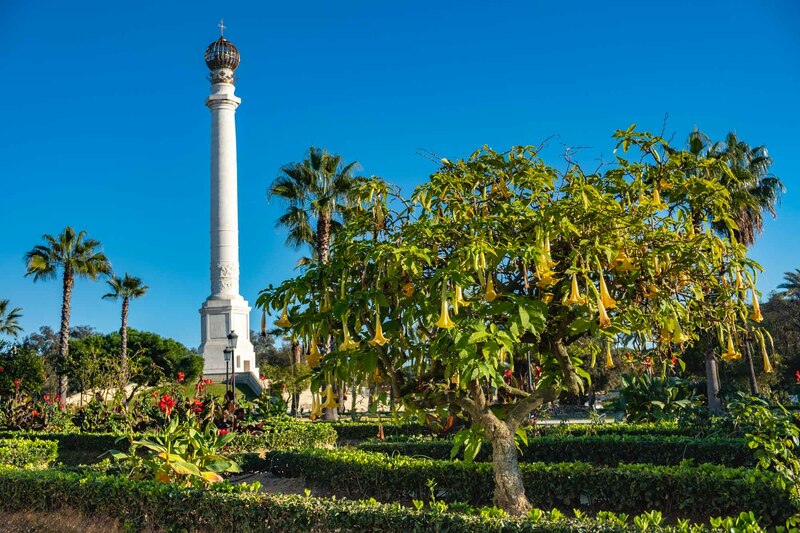 In the rose garden near the monastery is the Monumento a los Descubridores which was built in 1892 to commemorate the fourth centenary of the discovery of America. The Parque Botánico José Celestino Mutis showcases more than 20,000 species of flora collected from five continents. 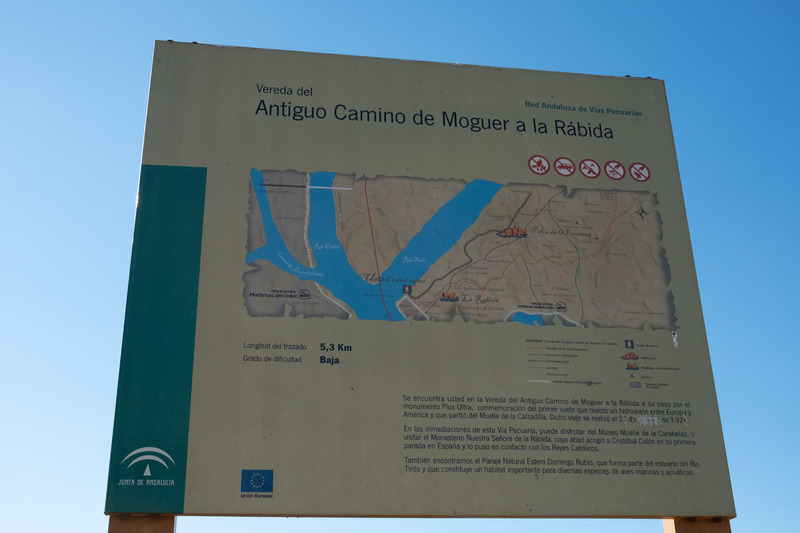 This easy walk of 5.3km from La Rabida up to the pretty town of Palos de la Frontera should take you about an hour. The now landlocked Palos de la Frontera was originally a port and starting point for Columbus’s voyage in 1492. The Pinzon brothers who captained the smaller vessels of Nina and Pinta to America were resident here and you can visit their house, Casa Pinzon as well as a statue of them. The church of St George and the well from which the intrepid explorers are reputed to have drawn their fresh water for the voyage are all currently in evidence. 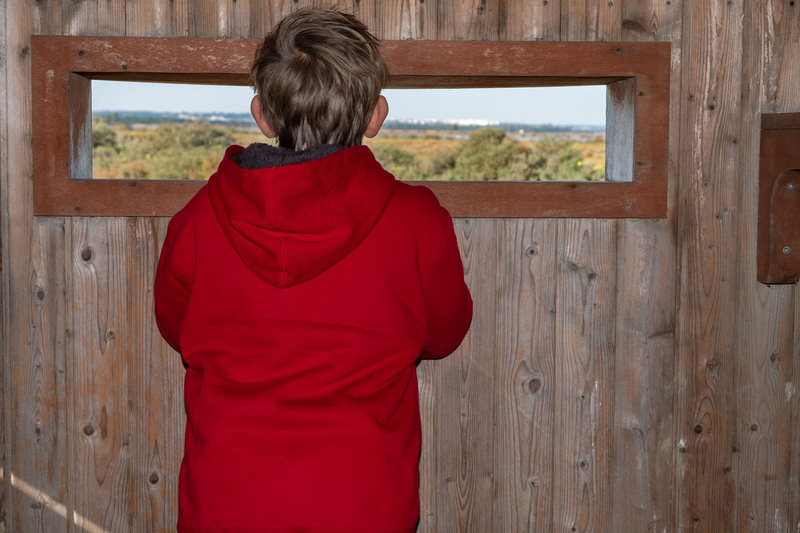 Sitting above the town of Huelva is the lookout. It’s been thoroughly neglected but underneath it lie some paths that lead to the city’s Roman water vestiges which collects water from an underground aqueduct that runs through the head of the conquero. 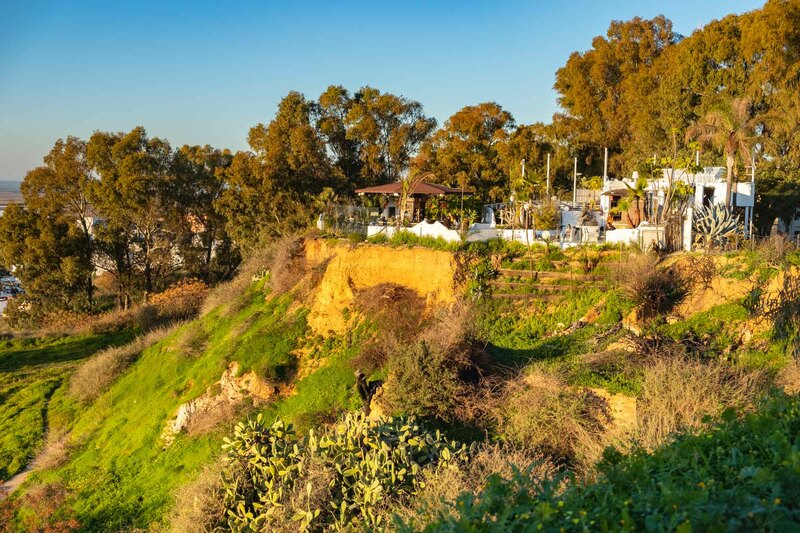 Perched on the side of the valley is a bar called Mandala and from here you can watch the sunset go down. 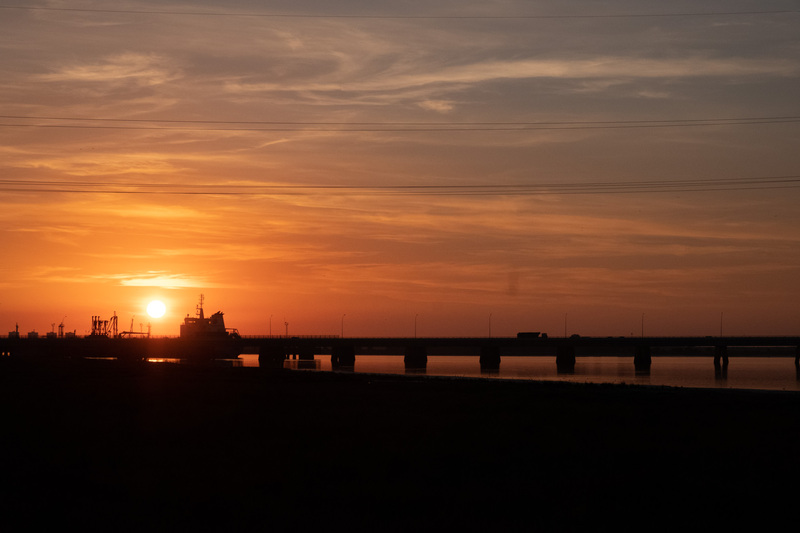 Huelva benefits from some seriously good sunsets although they do overlook the industrial zone! 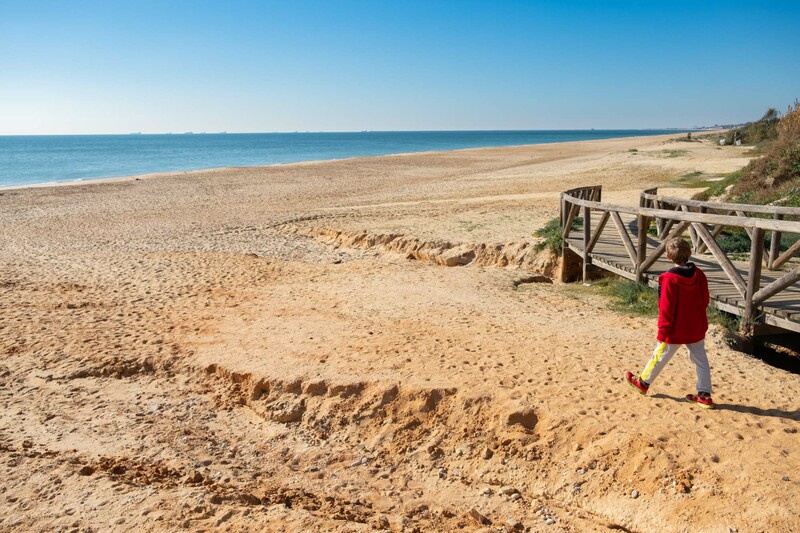 In the local area around Huelva there’s 120km of sandy coast line to discover. 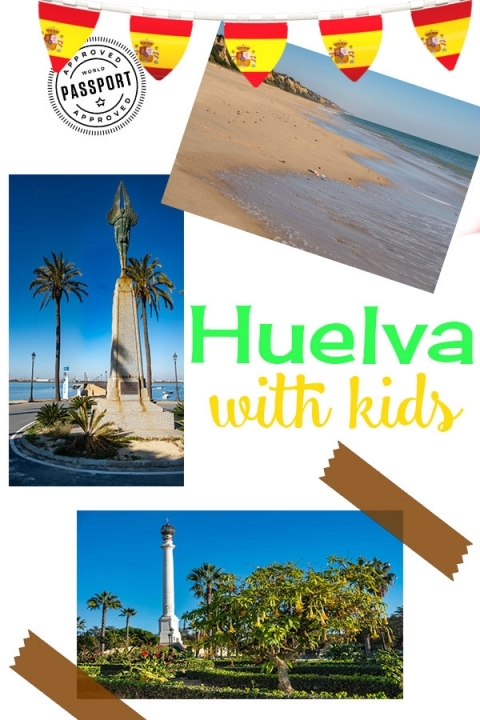 It’s of no surprise then that in the summer Huelva is a popular area for Spanish tourists. However in the winter it seems to be very much locals only and most of the sea front businesses are closed down. The winter temperature is still about 18*c and the skies are bright blue and full of winter sun. Punta Umbria – A fine, clean sand beach sits on a peninsula and the sea extends into the estuary. It can be a popular place in the summer where there are a number of restaurants and a vibrant nightlife. Playa de la Ria – This is an estuary beach with a strong current where the water deepens. Playa de El Portil – Playa El Portil is a patrolled beach and one of the narrowest beaches in the area at only 40m wide however it is 3.6km long. Playa de la Bota – Playa de La Bota has a reputation for being the busiest beach in the summer since it’s the easiest to access from Huelva. Lifeguards patrol but there’s a strong current and people are encouraged to swim between the flags. 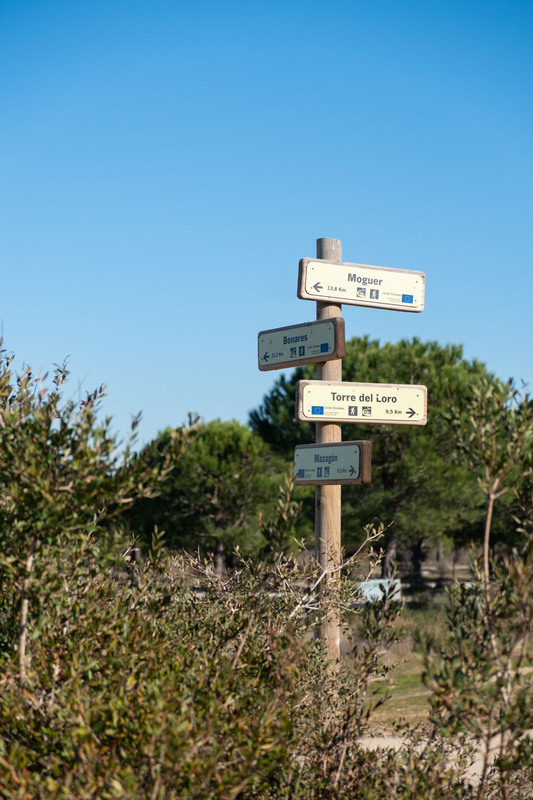 Playa El Espigon – Drive through the Marismas del Odiel wetland area and continue until you reach the beach. It is relatively quiet. Playa San Miguel – This sandy estuary beach of the Rio Piedras is protected by a long sand spit and is perfect for paddling. Playa El Rompido – An urban beach with lifeguard patrols and cafes. It is approximately 1km in length. Playa la Fletcha – You’ll need to catch a small ferry called the ‘Flechamar Dos’ from the Marina in El Rompido to access this large, duned beach. Don’t get stranded and miss the last ferry! Playa de Cuesta Maneli – You have about a 15 minute walk to reach the beach. The boardwalk takes you through pretty scenery of gorseland towards a long beach surrounded by sand banks. Playa los Enebrales – This family orientated beach was described to us as being a bit wild beach with no bars or toilets. I wouldn’t describe it as wild as there are hotels and apartment blocks within sight. It only takes about three minutes to cross the boardwalks, traversing a magnificent pine forest. Shells litter the sand so watch your feet. 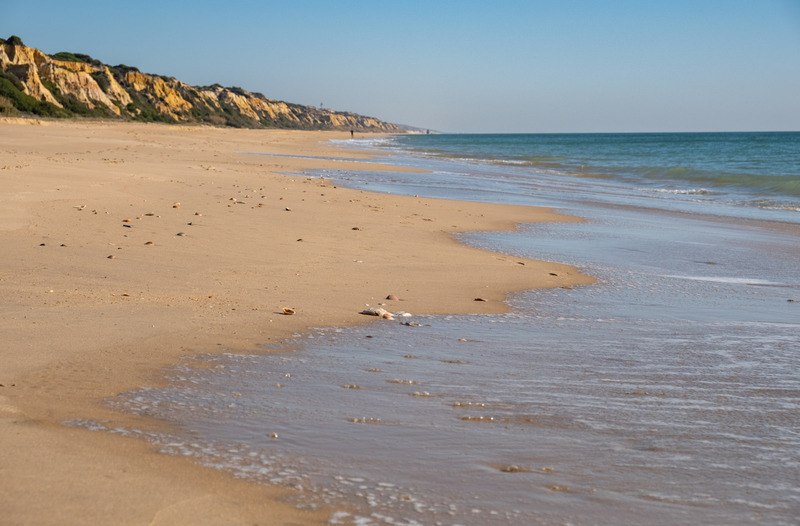 Playa Parador de Mazagon & Play del Alcor – Opposite the Donana national park is this long sandy beach protected by sand cliffs on one side. The beach stretches all the way down the coast from the mouth of the river at Magazon Marina down to the Rio Guadolquiver, approximately 40km. 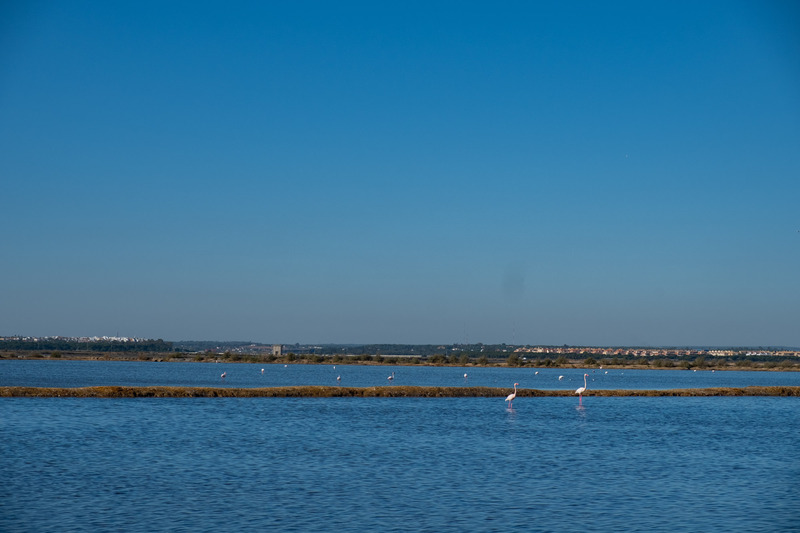 Opposite Huelva is the Natural Park of Marisa del Odiel. 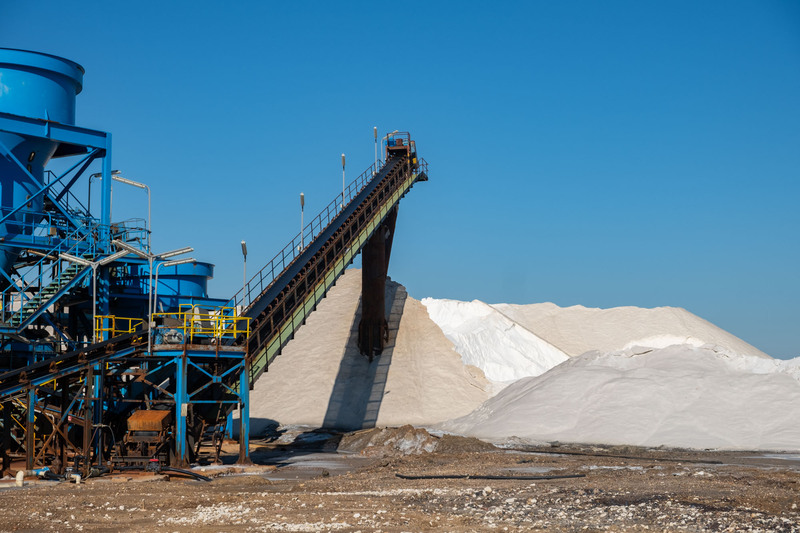 It is a UNESCO Biosphere Reserve and somehow the salt industry that is located there balances with a thriving bird life. As you enter the park you’ll pass a number of salt flats and then the enormous mounds of salt that are processed. It’s pretty interesting to watch the quantities of salt being produced. At the entrance to the park, you will find the small visitors centre with an exhibition about the park itself. You’re supposed to park here and walk to the observation huts, although we drove between them and parked on the side of the road. Expect to see lots of flamingos, heron, egrets and other wading birds in the shallow waters. 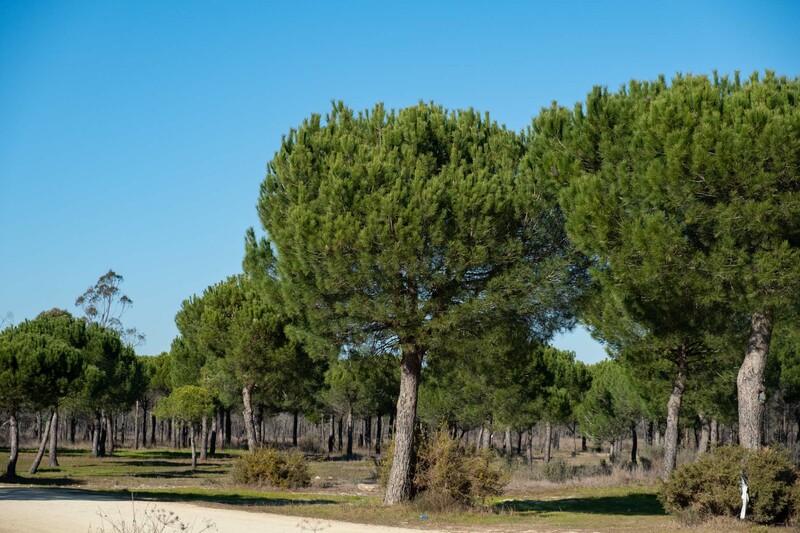 Donana is the largest Nature reserve in the area and about a twenty minute drive out of Huelva. It was designated a UNESCO World Heritage Site and it’s said that there are red deer, wild boar, lynx, purple heron and eagles in the area. This is a brilliant park for long hikes and bike rides. 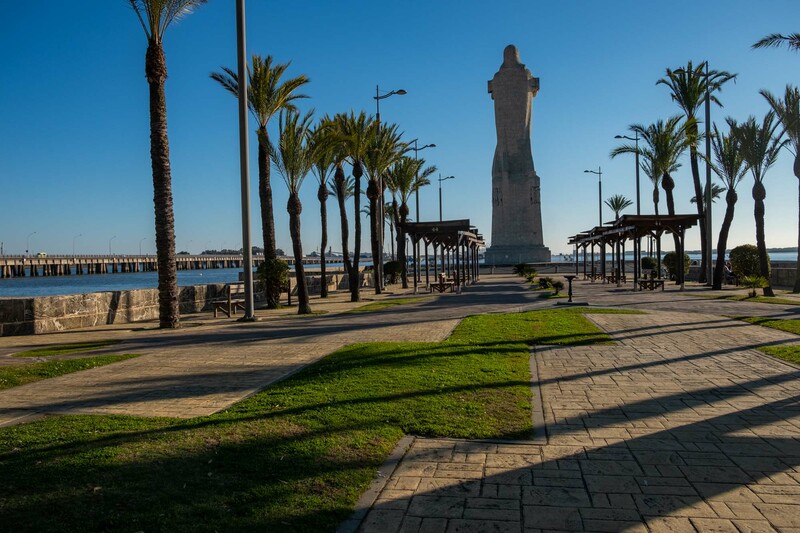 Located at Punta Seba where the mouth of the River Tinto meets the Odiel is a 37m high statue to is dedicated to the sailors who aided Columbus in the discovery of America. There’s a cute little beach which is perfect for paddling and it’s also a brilliant spot to watch the sun go down.